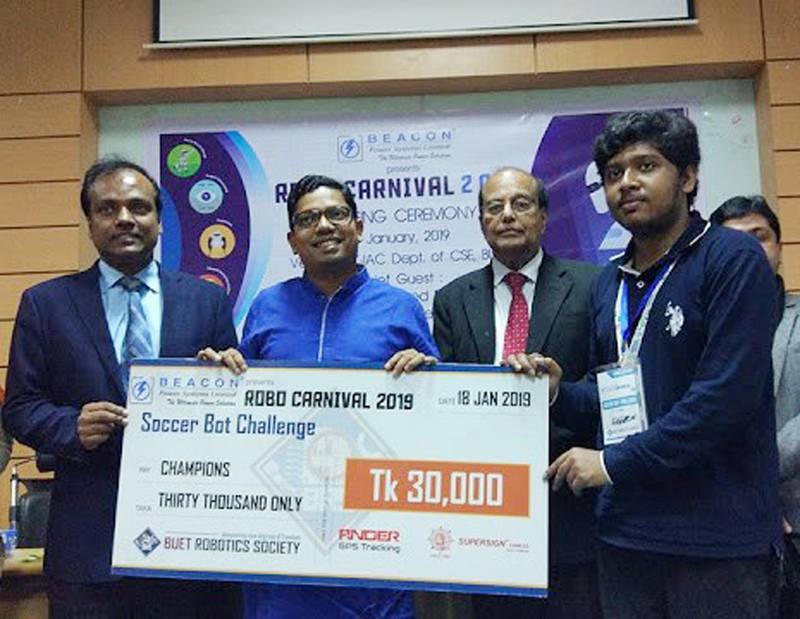 Mr. Zunaid Ahmed Palak, State Minister of Information and Communication Technology Division of Bangladesh handing over the Champion prize in soccer bot category of BUET Robo Carnival-2019 to the members of ‘DIU Graviton’ team of Daffodil International University. Daffodil International University students team ‘DIU Graviton’ became champion in soccer bot category of BUET Robo Carnival-2019. Mr. Zunaid Ahmed Palak, State Minister of Information and Communication Technology Division of Bangladesh handed over the prize to DIU Graviton team leader Syed Md. Omar Shaikh on 18 January, 2018. Syed Md. Omar Shaikh is a student of Computer Science & Engineering Department, DIU. Soccer bot is a football game among robots. Robots are played food ball in a playground but two team of competitors are controlled them from outside the playground. And finally maximum goal giver team win the game. Around 70 team from various university attended this soccerbot competition and DIU Graviton team was faced with Military Institute of science & Technology team in the final round. The team DIU Graviton was won the game by 3-1 goal. Bangladesh University of Engineering & Technology (BUET) was arranged this Robo Carnival-2019 in 3rd time.